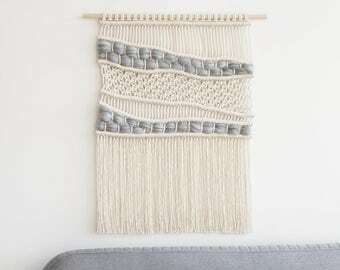 Small Macrame Backdrop- Home wedding Decor- Boho macrame Headboard- Cotton Macrame- Wall hanging Small- Macrame Wedding Gift- "ALETTA"
Add a minimalistic, elegant and some modern softness to your room with this gorgeous macrame wall hanging from Teddy and Wool. This lovely hanging is handmade with 100% natural cotton cords and brass elements. The perfect combination for any interior. 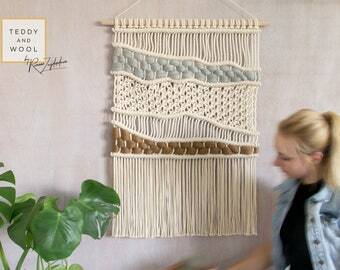 This handmade macrame wall hanging is made to order and will take 3 - 5 days to create. Shipping is free and will take around 2 - 3 working days to arrive using UPS. 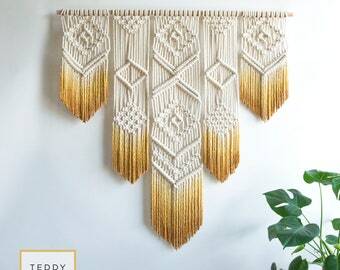 Large Macrame Backdrop- Home Decor- Wedding Decor- Boho Decor- Macrame Headboard- Wall art- Interior Design- Macrame Wall Hanging -"ALET"
Extra Large Macrame Wall Hanging – Macrame Backdrop – Large! 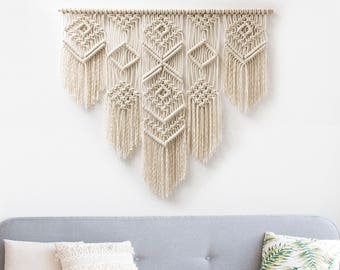 63" x 40" – Macrame Headboard – Boho Backdrop – Macrame Wall Art - "Deep Lake"
Large Wall Hanging- Wall Art Tapestry- Modern Macrame Wall Hanging- Color dyed Tapestry- Bohemian Backdrop- Home Wedding Décor- "Deep Roots"
Large Wall Hanging - Large 63"x40" - Pink Wall Tapestry - "Rose Quartz"
Macrame Wall Hanging - Natural Wall Hanging - White / Beige Wall Art - "EVA"
Macrame Wall Hanging - Macrame Curtain - Macrame Wall Art - Geometric Art - Wall Tapestry - Macrame Headboard - Dyed Boho Ombre - "ISA"
Macrame Wall Hanging - Woven Wall Hanging - Brown and Gray wool - 'Earthy' Macrame Tapestry - "ELLA"
I bought this as a gift from my daughter. It's a beautiful piece of art and my daughter can't wait to hang it. 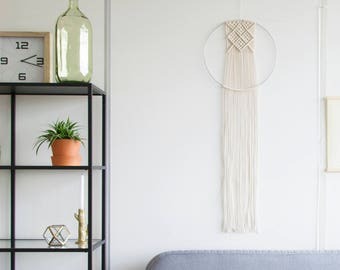 Macrame Wall Hanging - 4 sizes Small, medium, large, XL - Macram Unicorn Tapestry - Farmhouse Wall hanging - Macrame art- Home Decor - "EVA"
Wie immer bin ich voll und ganz zufrieden. 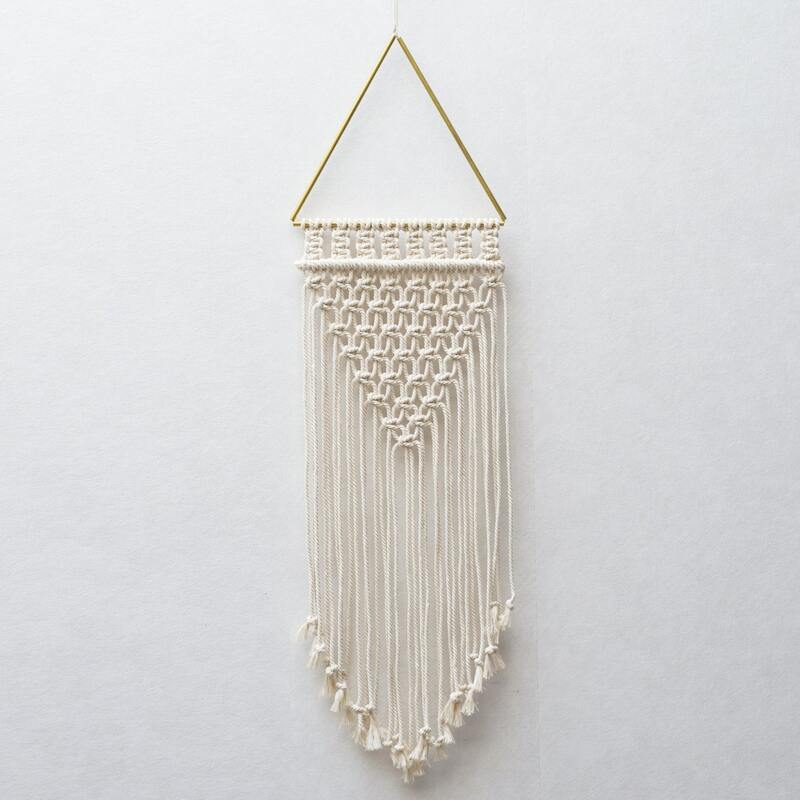 Macrame cord 6mm - Twisted Cotton Rope - White Cotton Cord - 100% Natural Cotton String - Macrame Pattern - Craft Yarn - Rope -"Ivory White"
Round Macrame Wall Hanging - Circle Tapestry - Available in different sizes - "Seaside"
Yes, I offer customization! 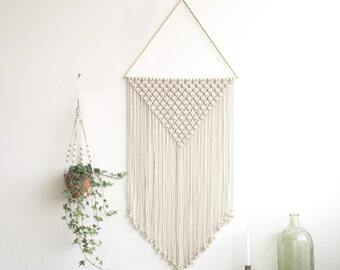 Any of my wall hangings or plant hangers can be customized to your own specific vision. 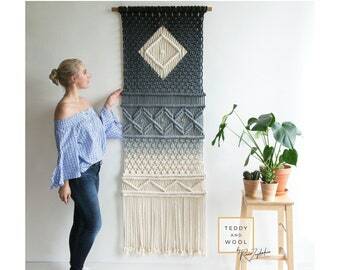 Please send me an Etsy message or click "Request Custom Order" to discuss your design, sizes, materials, and pricing and find a unique handmade fiber art piece that is perfect for your space! - I use a natural cotton for all my work. Sometimes the ends of the cotton rope can fray slightly. To prevent this as much as possible, it is treated with an anti fraying solution. 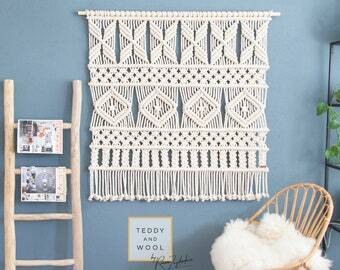 - To clean your wall hanging, only lightly dust the piece. - Do not use a damp cloth or steam cleaner to clean the piece. Any used dye can run out and you risk damaging the cotton fibers. 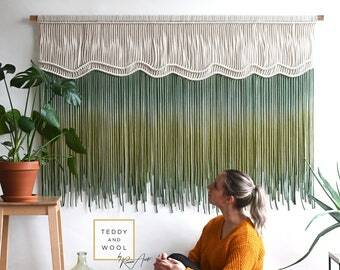 Please be sure to follow these instructions to ensure a long lifespan for your precious wall hanging. 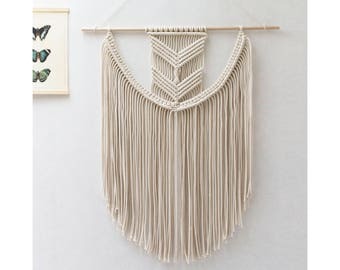 I offer wholesale for some of my bestselling handmade wall hangings. Please contact me for specifics if you are interested. I offer gift wrapping and you are able to add any personal message for the lucky one who receives your gift. All items are packaged with the greatest love and care. Where can I find reviews of your work? Please make sure to read product descriptions, dimensions and policies carefully before completing your purchase. 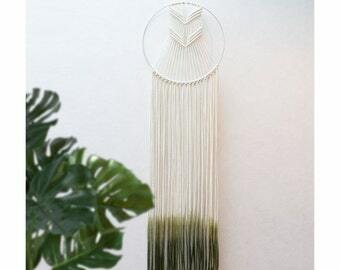 Dyed Macrame Dreamcatcher - Dream Catcher wall hanging - "KIRA"
Macrame Dreamcatcher - Macrame Wall Hanging – Boho Wall Art - Macrame Hanging - Wall Decor -Wall Tapestry art - tapestry screen - "KARA"
Large Macrame Wall Hanging - Woven Wall Hanging - Macrame Tapestry -Bohemian Wall Hagning - Macrame Curtains -Home Decor - "ORGANIC GRAY"
Large Macrame Wall hanging- Home Decor- Wedding or boho Decor- Macrame Headboard- Wall art- Interior Design- Macrame Backdrop - "Raw River"
Extra Large Macrame Wall Hanging - Large! 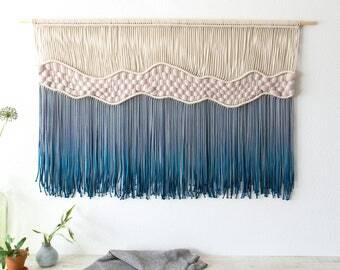 63" x 40" - Fiber Art - "Where The Waves Break"
Large Macrame Wall Hanging - Macrame Backdrop - Wall Hanger - "AVA"
Macrame Wall Hanging - Dyed Diamond Tapestry - "Doris"